To develop a confident, competent, and complete martial artist. Our children's programs build a solid foundation for martial arts mastery as an adult. Our students gain the physical skills to defend themselves while learning the importance of courtesy, respect, and good citizenship. Combine the standing techniques of Soo Bahk Do (Korean karate) with the self-defense techniques and anti-bully tactics of Gracie Jiu-Jitsu. At Hampton Roads Karate, we supplement soo bahk do (a standing/striking art) with Gracie jiu-jitsu (a complete martial art in itself that relies on taking your attacker to the ground then neutralizing them using leverage rather than strength or speed). In the Children's Programs, we orient training toward self-defense applications rather than sport competition. We also stress memorization and application of forms (kata), respect and courtesy toward training partners, and physical fitness. 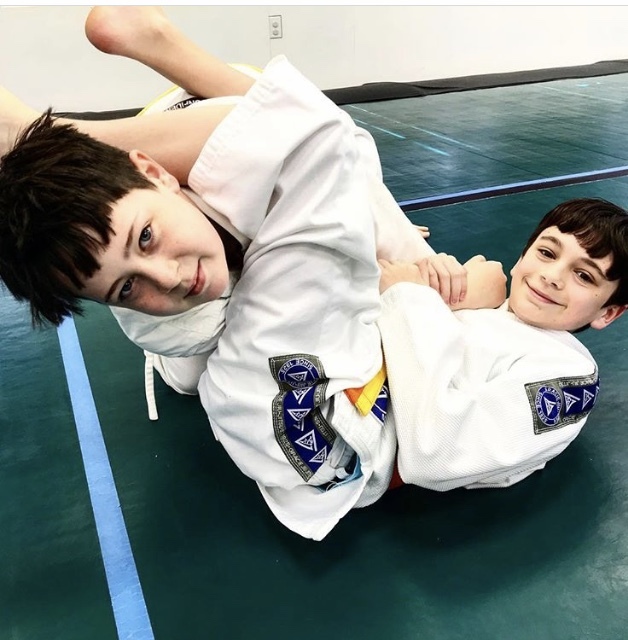 The three children's programs are CHILDREN'S KARATE (with classes each week for two levels of beginners,intermediate, and advanced students), CHILDREN'S GRACIE JIU-JITSU (Gracie Bullyproof Course and Jr. Grapplers), and, coming soon, the PEEWEE PROGRAM. See the detailed descriptions of each class in the following paragraphs. You may attend all classes that are appropriate for your skill level. A beginner, for example, may attend the two beginner CHILDREN'S KARATE classes and two GRACIE BULLYPROOF classes for up to four classes a week. We award a "student" black belt at age 16, but require students to turn 18, earn a Gracie jiu-jitsu blue belt, and graduate from high school for award of the full 1st degree black belt. Classes last between 45 to 60 minutes and consists of a warm-up; striking and blocking drills; form practice; self-defense/sparring; conditioning; and cool-down/stretching. Time allocated for each part of the training depends on individual needs. Classes focus on learning to pay attention to detail with greater emphasis on free-sparring and using basic Gracie jiu-jitsu self-defense techniques geared toward escaping an attacker. In our Children's Karate classes, we use soo bahk do (Korean word for "karate") to teach how to strike with power, move with balance and coordination, and avoid being hit. We employ traditional training methods (forms/kata, repetition, emphasis on proper technique and body mechanics) while stressing the practical application for self-defense to develop a solid foundation for martial arts proficiency as an adult. Each class consists of a brief warm-up stretch followed by striking drills (kicking and punching bags/pads), sparring drills, and forms (kata) practice. Forms (kata) serve as our link to traditional training methods and is a proven method for developing powerful stances and understanding of body mechanics. We supplement the standing techniques of karate with Gracie jiu-jitsu;(a complete martial art in itself that relies on taking your attacker to the ground then neutralizing them using leverage rather than strength or speed). This is NOT a mixed martial arts class. The focus is on self-defense, not sport. The program encompasses approximately 196 hours of instruction divided into two levels of Beginner, one level of Intermediate, and one level of Advanced classes. Classes last 45 minutes and consists of a warm-up; striking and blocking drills; form practice; self-defense/sparring; conditioning; and cool-down/stretching. Time allocated for each part of the training depends on individual needs. Hampton Roads Karate's Gracie BullyProof program featured in the local news.